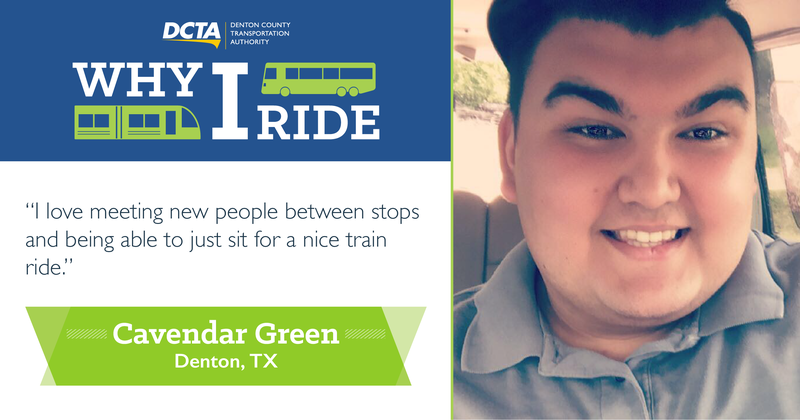 Whether he’s admiring the scenery or chatting with a stranger, Denton resident Cavendar Green makes sure to utilize his time on DCTA vehicles to the fullest. See why Cavendar uses DCTA to get around North Texas! Q: Why do you ride DCTA? A: I ride DCTA because I love to feel a little bit of freedom. I love meeting new people between stops and being able to just sit for a nice train ride. A: Sitting on the train and talking with strangers is absolutely amazing! It’s wonderful to connect with people and learn things about them – even learning that you have a lot in common. I also love being able to get to see the scenery outside the windows crossing over the lake at the Highland Village/Lake Lewisville Station. Seeing how hard the conductors and other DCTA employees work is great. Every time I ride DCTA I feel safe, calm and relaxed. Q: Is there anything else you would like to share about your experiences with DCTA? I enjoy riding the train and buses to work each day because not only is it enjoyable, but it saves me a lot of money. I am so grateful that Denton has such an awesome public transportation! Thanks for sharing with us, Cavendar! Make sure to tell us why you ride DCTA here for a chance to win 10-pack of regional day passes.